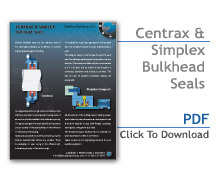 Simplex Americas proudly offers Centrax & Simplex Compact Bulkhead seals. Centrax Bulkhead seals from Simplex Americas are the optimum solution for sealing watertight bulkheads to protect adjoining spaces against flooding. Two segmented carbon rings which run directly on the shaft are mounted in an axially split housing made of aluminum which is installed in the bulkhead opening. Garter springs and a sectioned thrust ring ensure proper contact of the sealing faces on the shaft and on the sides of the housing. Radial and axial shaft movements are taken up by the Centrax bulkhead seal without any problem. With Centrax bulkhead seals, there is practically no wear owing to the efficient self-lubricating property of the carbon rings. For applications requiring a gas-tight and water-tight seal, Simplex Americas LLC supplies the Simplex-Compact lip-type bulkhead seal. Simplex-Compact bulkhead seals are largely modeled after the forward Simplex-Complex seal. The key difference in the bulkhead seal design is that the two sealing rings face one another, which creates a barrier chamber that is filled with oil. In turn, the barrier chamber is connected to a four-liter oil tank. With Simplex-Compact bulkhead seals, permanent cooling and lubrication is provided via a circulator. The outer dimensions, pitch circle and recess of the seal can be adapted so that the seal accommodates bearings, shaft flanges, couplings and other bulkhead components. It is available axially or radially split to ensure the best performance possible. Simplex-Compact bulkhead seals set the industry standard. Simplex Americas LLC is proud to be the only supplier of the Simplex-Compact bulkhead seal. Contact us today for ordering information.